One of our readers submitted this item to our website - I hope you enjoy reading about these animals as much as I did. The authorities estimate that there are between 8,000 and 10,000 Wolves in the province of Ontario. This estimation was made over 40 years ago and has remained unchanged. However no reliable survey method has been employed to find updated numbers. There are species of Wolves in Ontario - the Wolves (Canis lupus) and the Eastern Wolf (Canis lycaon) which is also known as the Algonquin Wolf because of its presence in Algonquin Provincial Park. The Ministry of Natural Resources implemented a permanent ban on hunting and trapping Wolves and Coyotes in 40 townships surrounding the Algonquin Park recently in an attempt to curb the decline in the park's Wolf population. The Eastern Wolf has been added to both the National and Provincial "Species at Risk" lists as a species of “Special Concern”. On New Years Day we were all sitting in the living room looking out into the field across the road, and there was a Wolf there trying to catch a black-bird. He was much bigger than a Coyote and we took out the binoculars just to be sure - I caught a good look at his face and sure enough, there were those white wolf markings. He made his way over to the barn behind the neighbour's place, who keeps rabbits for shows. Must've smelled good to him! Then on Sunday morning at 4:45 we were awakened by Coyotes yipping and barking close by. It sounded like they were in our back yard. Sure enough, we looked out the window and saw four Coyotes right behind the ditch that borders our backyard. They have been killing wild rabbits there because on Saturday our little Bichon dog had the remains of one, a clump of rabbit hair, in her mouth. These Coyotes were about the size of an Australian Sheep dog. The Wolf was the size of a large German Shepherd dog. Anyone that thinks there are no Wolves in Southern Ontario should come to our house and sit and watch and wait! Actually you are half right. The wolves you are seeing are in fact, most likely, examples of the Eastern Coyote, which has been known to carry Eastern (Red) Wolf gen, are making some of them larger than the western coyote. These genes alone do not guarantee a larger size, however, as in a recent study, one of the smallest "coyotes" caught turned out to be 89% Wolf! Regardless, Coyotes are an amazing, sociable, and cunning predator who deserve the same awe wolves often receive, as they are very similar. 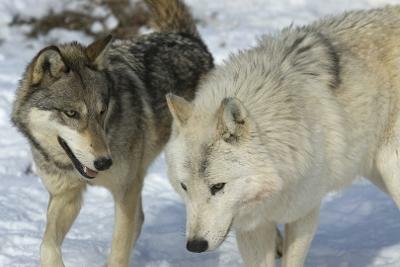 In fact, they could actually be considered the stronger of the 2 animals as they continue to adapt and thrive, despite unreal persecution, the same persecution that all but wiped out two species of wolf and many other species from the US as well as many species here in Canada. Wow, Hammer - you sure know a lot about Coyotes and Wolves - thank you so much for your input, we really appreciate your information! I live in Barrie and have had Coyotes on my property for years, but for the last 2 years have had several sighting of wolves. Of course nobody believed me until I finally caught him on film. There are still some doubters who believe it is just a large Coyote, but within the last 2 weeks there has been one large wolf making himself visible to cars passing by and sniffing around my dog pen, so people don't think it's all my imagination anymore. Yup, my family knows all about them! I have a very similar story, there ARE wolves in Southern Ontario! !